If you're connecting a custom email account (e.g. one that you have hosted on your own server), or setting up a different SMTP for sending, this guide will take you through the advanced setup process. Even if that's "advanced", it's actually quick and easy, so let's get to it! 1. Click "Add Email Account"
Go to Settings, and click the tab "Email Accounts" tab. You’ll be able to see all the email accounts that you’ve added before here. Start adding a new one by clicking "Add Email Account". 2. 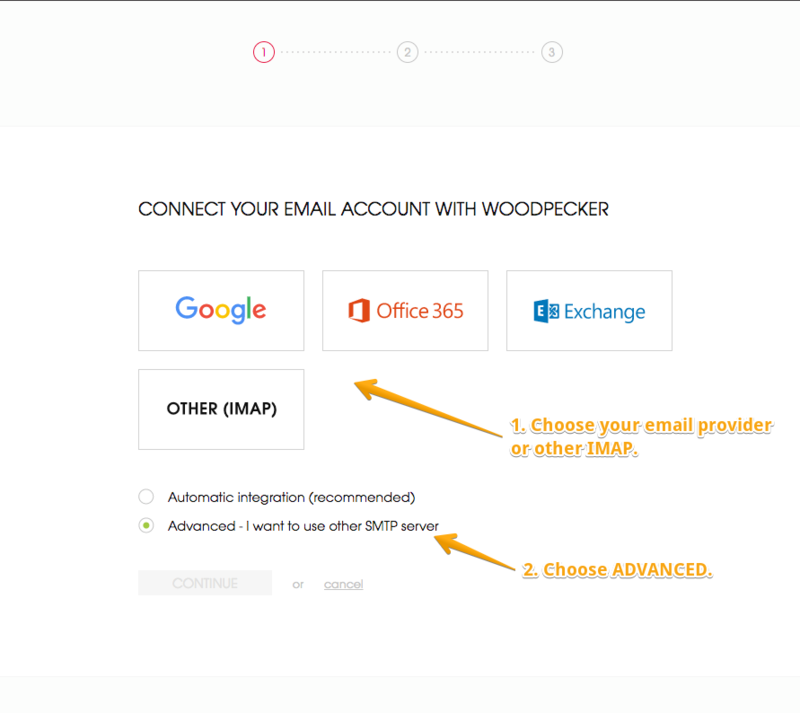 Choose your email provider or select "Other (IMAP)"
Please choose whether you wish to connect an email account on Google, Office 365, or Microsoft Exchange, or an mailbox based on your own server ("Other (SMTP)"). Next, select " Advanced - I want to use other SMTP server", and click "Continue". Notice that when you click on one of the email providers, you'll see the relevant information about the sending limits. That helps making sure that you do not send more messages than you're allowed to, and avoid getting blocked by your provider. Type in your email address or login, password, and the IMAP server address for this account. Trouble finding it? Try your settings in your mailbox, or check your email provider's help page. Choose the SMTP service from the dropdown menu. It can be Sendgrid, Mailgun, Google, Office 365, Microsoft Exchange, or any other SMTP. FillDepending your choice, you may be asked to provide an API key. Add your From Name and signature here, or do it later by editing your email in Settings > Email Accounts. Click "Connect" / "Add" and wait until Woodpecker finishes the configuration. 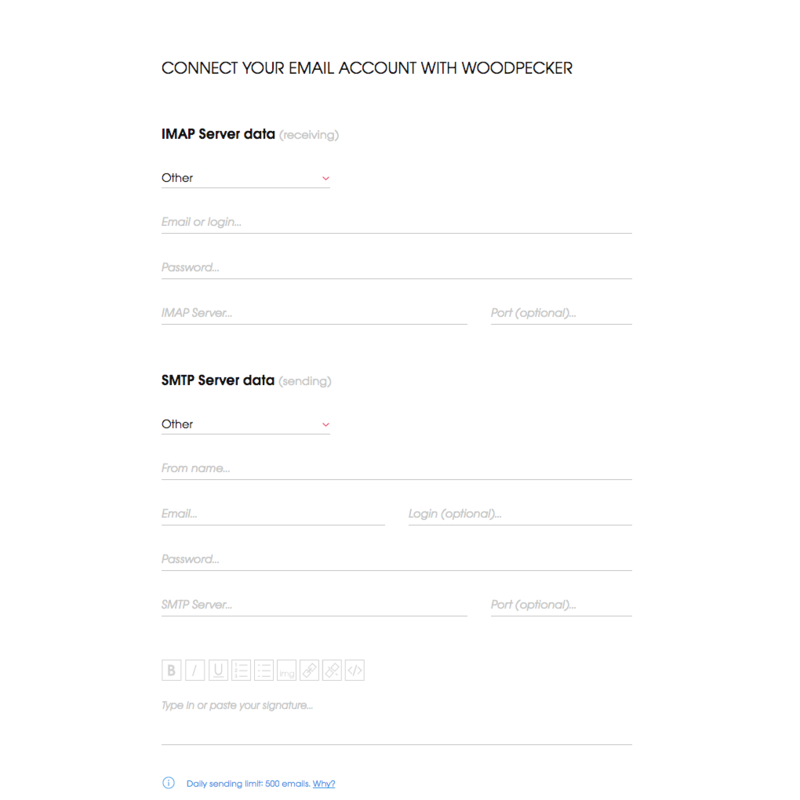 Note: Woodpecker may connect your email address conditionally Check what that means here.